Howdee all, XSeed was so kind as to stuff our mail box with a copy of Lunar, Silver Star Harmony on the PSP. Here is my most humble review. 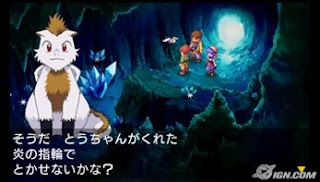 Synopsis: The wonderful tale of Lunar makes its way to the PSP. Harmony is not the first iteration of the Lunar story. The franchise first started on the Sega CD, went onto just about every known video game platform before the time of PS2. It’s a classic Hero coming of age tale where Alex who is on a adventure to be the next Dragonmaster following in the footsteps of his hero, Dragonmaster Dyne. Alex, along with Luna and his flying best friend, Nall, team up with various people along the way to complete the quest to become the next guardian of the goddess Althena. 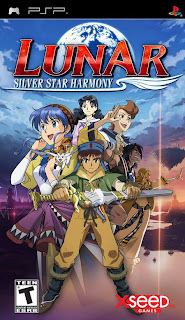 Praise: Lunar: Silver Star Harmony is a great adventure with a great cast of characters. The graphics of the main game have been improved as well as they have added voice over for some of the text. They also added showing the main characters as they are talking with text. This is a new feature that gives you a view of the character and the emotions they are showing during those moments. The original Lunar was famous for likable characters, great character development, and a story that was top notch. 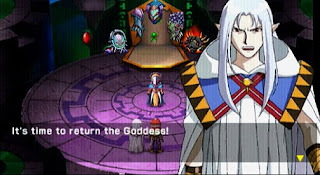 The original had animation cut scenes that became the trademark of the Lunar games. Harmony has all of this and more. The 2-D graphics have been completely revamped as well as they have added a playable Prologue that wasn’t available in previous editions. The musical scores of the game have been improved upon and are really enjoyable. They give you a good feeling as you are playing and as the music changes depending on the situation you are in, will completely submerse you in the game play. The witty commentary by Alex’s flying smart talking friend, Nall, gives the game a lot of humor and I found myself waiting to see what he said next. He insults, he begs for fish (his fav food) and just all around hits on the women. A feature that you no longer see in RPG is the Auto-Battle option. You can choose to have the computer choose the choice of your characters, or choose a tactic that will either have all attach, defend, or individual AI for the character. You also have an option to make your own tactics, i.e. one defends, one attack, and one uses AI. This is a great feature that I miss in the RPG games of today. When you are battling a bunch of low level characters, just choose all attack and let it go to work. This will save you time and energy of assigning actions to characters on low level enemies. Complaints: With new graphics, voice over, and stylish drawing type graphics, comes the load times. Each time you change the current scene you are on, i.e. going into a building, going to a new section of town, gives you a lengthy 5-6 second load time and a drawn fade out and fades in type scene. This might sound petty, but when the towns are only two or three screens big, and you can go into damn near every house, this load time really adds up. Another thing that annoyed me, but this is coming from a fan of the original, is they changed the songs at the beginning of the game and a scene on a boat with Luna singing. Believe it or not, these were some of my favorite songs when I was a kid and I was really looking forward to hearing them again, but alas, they were not there. The songs were changed to fit a more, romantic feel of the game. I also felt they could have redid the animation scenes, with changing the songs, they kept the mouth moving to the dialogue of the old songs, giving it a kind of dubbed Japanese kung fu flick. The voice over is very inconsistent. It goes from good one scene to bleeding from the ears in another. I feel these little issues keep Harmony from being the end all Lunar game. It really will not draw too much away from the game, but for original fans such as myself, it can be really annoying. 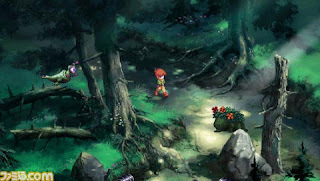 Overall: Lunar: Silver Star Harmony is a great game with new features. The story line, though cliché by today’s standards, is still a great tale of Alex and his friends. For anyone that has not played a Lunar game, I would suggest starting here if you have a PSP. Xseed did a fantastic job on everything with a few minor issues that do not draw too much away from the game.